Fly Zombie Fly is entertaining and difficult at the same time. Play online Games untill you can. 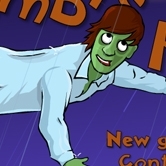 Swing your zombie left to right and then hit the spacebar to fling him as far as you can and get increasingly farther distances in this novel take on the classic canon shooting concept. Upgrade your tools in the game shop to fly even farther!